Meetings and conferences are an evident part of a business. To run a business successfully and broaden ones horizons, business owners need to hold meetings with clients, employees and other important people. Such meetings cannot be held at any given place. There is a room specially devised for these occasions. 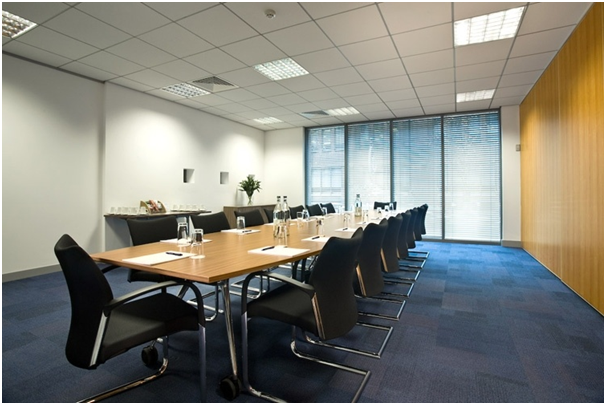 Conference halls or board rooms are the places that are suitable to hold meetings. The meeting rooms in Bangalore are designed in such a way that they help the people, who are holding the meetings. Earlier, a conference room was only a plain large room used only for meetings. There was a table in the centre with several chairs around it. But, today the room is designed in the most ultramodern way consisting of the latest technologies. Usually, shape of the room is either rectangular or square. The size of the room may vary according to affordability. But, meeting rooms must be larger in size than the other rooms of the office. It must be able to accommodate all the workers at one time if the situation requires. One large door is enough while large windows on at least two walls will be welcome. The windows must have thick screens so that the multimedia presentations do not get effected. The conference table is very important furniture in the room. You can choose among square, rectangle, oval and circular tables. While rectangle tables are for larger spaces, square is good for smaller crowd. Oval is considered the best with its safe round corners. Round tables can save a lot of space. The number of chairs would depend on the meeting that you will hold and what the attendance is regularly. For additional seating arrangements during large gatherings, folding chairs need to be stocked up. You can also have a small table at one corner where people can leave their stuff before sitting for the meeting. The conference hall must have continuous power supply. Electric sockets, switches and lights must be available at all walls. After all, you will be running projectors and computers inside the hall. You may not actually write on it, but it is mandatory. You will have to get one mounted on the wall. It can also act as a screen for power point presentations. It will be good if the white board is on the podium because speeches, presentations look better when done on a podium. However, a podium is not a compulsion as it can take up more space. It is good if you have a storage area where the people who attend the meetings can keep their belongings. The space does not have to be very big but should suffice at least a small crowd. As much as a meeting room is necessary in an office, the room should be made in good taste. With white coloured walls, wooden furniture and carpeted floor, a conference hall can impress clients as well as visitors.